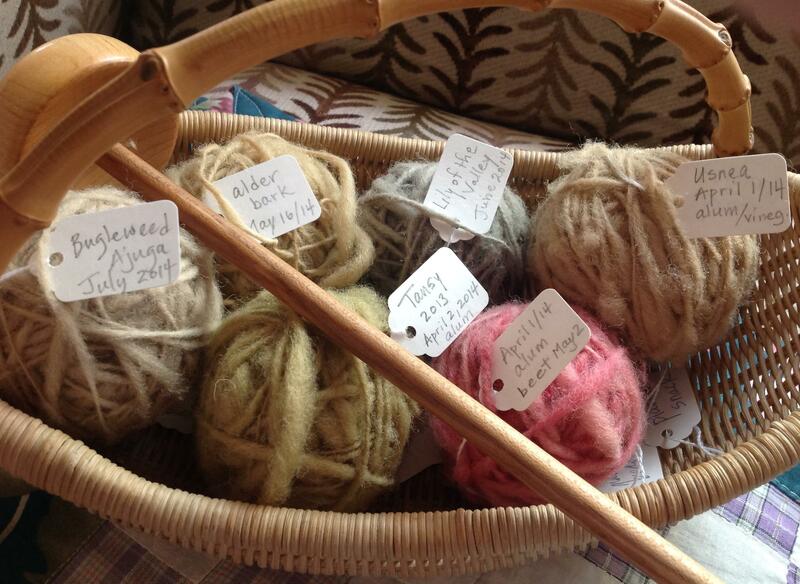 All spring and summer, I have been dyeing wool roving with dyestuff collected from the roadside and garden. I have always intended to use this wool in some of my weaving projects, but lately, I have decided to first spin the wool roving into yarn. Everyone recommends learning first to spin with a drop spindle, later graduating to a spinning wheel. First, I went online to learn the basics and decide which drop spindle I should use. Then I ordered my maple bottom whorl drop spindle on eBay for $7.95 ( $15.60, including shipping). To spin, I first attach an end of the roving to the hook on the end of the spindle. The method is to tease out a sparse bundle of fibres and spin the spindle, twisting the section of wool into a thread. I spin the spindle counterclockwise, pinching the wool as I tease it out, holding the spindle still on my lap when I have to use both hands. Eventually, I will get better and be able to hold the spindle in the air with one hand and spin the spindle with the other. I do this a bit now, but I am plagued by breaking wool. 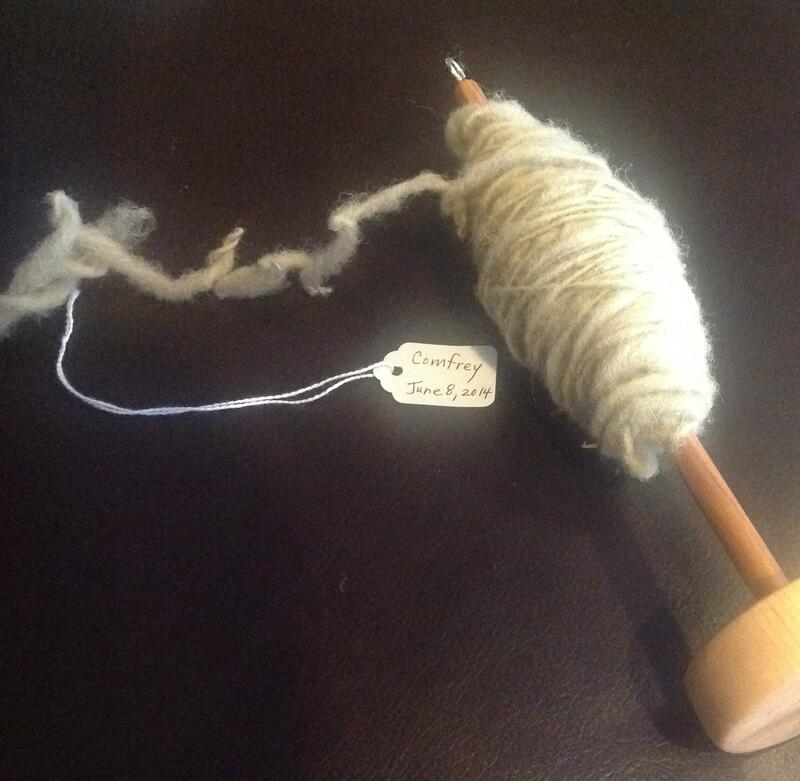 For an enjoyable beginner’s lesson in spinning, see Jennifer Beamer’s video at http://www.youtube.com/watch?v=FtBLIg4JhNI . Spinning with a drop spindle is addictive! I now spin the roving as soon as it is dry after dyeing. 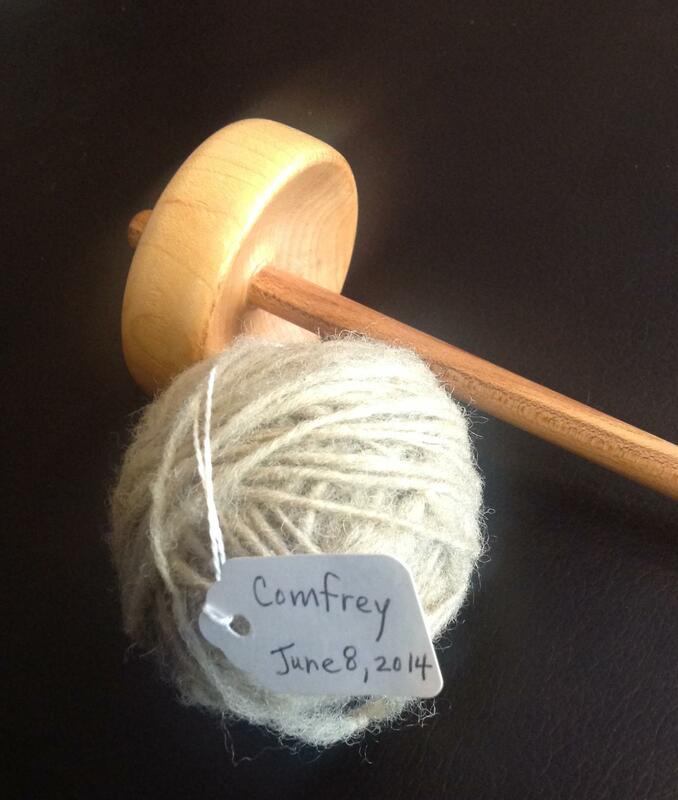 My yarn is still very knobbly – a little like the yarn you use to knit those bulky sweaters! My balls of yarn are getting better all the time, although I have trouble getting too much spin into the yarn, so it twists up on itself quite easily! So far I have eleven balls of wool: Tansy, Old-Man’s-Beard, Bugleweed, Alder bark, Lily of the Valley (2 balls), Beet roots, Beet leaves, Carrot leaves, Radish leaves, and Comfrey.